Today I’d like to talk to you about buttermilk. “Uhm, why?” You may be thinking. Because I use it a lot I suppose. Biscuits, scones, homemade ranch dressing, waffles, chocolate poundcake, in my smoothies…I use it a LOT. 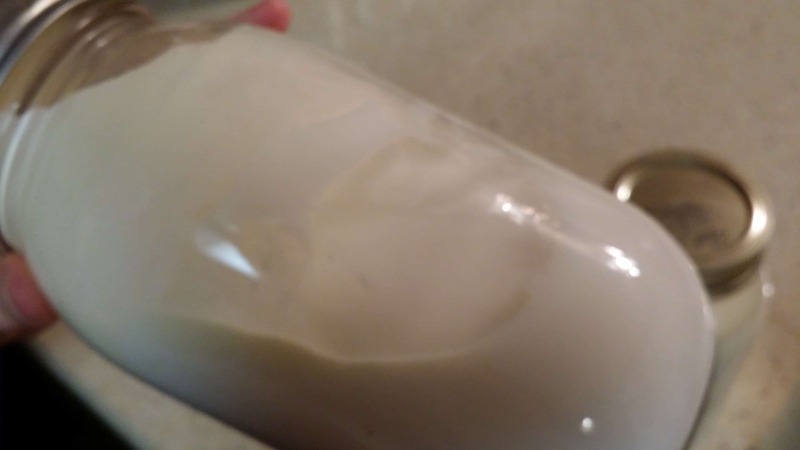 Since I was already getting fresh milk every week, I decided to try my hand at making my own. Easiest. Thing. Ever! And I’m going to tell you how to do it. Right after we talk about what buttermilk actually is. I just always assumed buttermilk was what was left over after you made butter. I vaguely remember making butter in a quart jar in Girl Scouts. We all sat in a big circle and passed the jar around shaking it and singing the Butter Song. 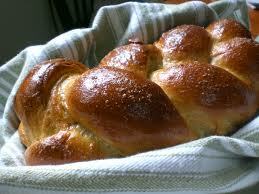 Then the leaders poured off all the not-butter stuff. And I thought that was buttermilk. 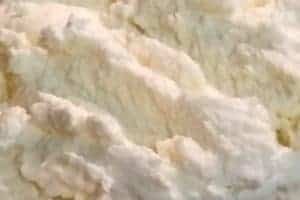 And while that making-butter-leftover-stuff might have used to have been called buttermilk, what we call buttermilk now is actually a cultured dairy product just like yogurt. So to make buttermilk, you simply introduce a specific culture to milk and let it do its thing. There is an easy way to do this and an easier way to do this. There’s really not a hard way to do this. Which is good. I like easy ways to do things. Especially good-for-me things. So let’s talk about the easier way first. You need milk and you need active culture buttermilk. And that’s all. Oh, and a quart jar . And a lid for the quart jar. But that’s all. Except maybe a spoon. And a 1/4 cup measuring spoon. But that’s all. Really. Ready? OK. Take the lid off the jar. 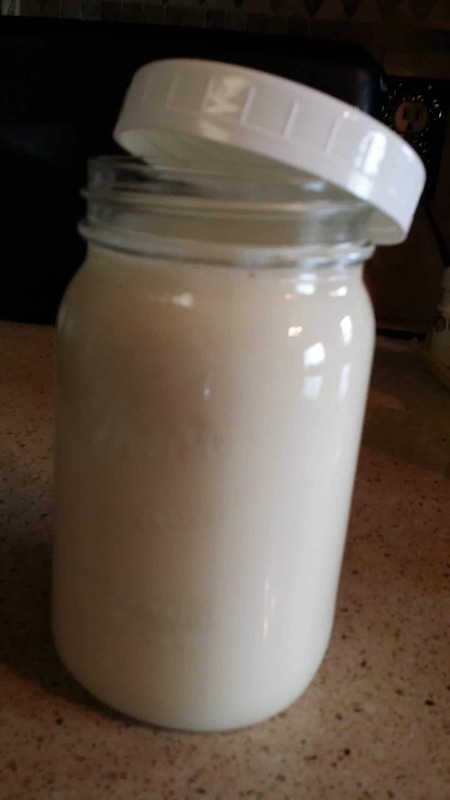 Put 1/4 cup of active culture buttermilk in the jar. Now fill the jar to the shoulder with regular milk. And stir. Or shake the jar up. Then put the lid on the jar. I suppose if you are going to shake the jar instead of stir, you should probably put the lid on first. Oops. So, after 12-18 hours, if you tip the jar it should be thick and buttermilk-y. Put it in the fridge for 6 hours before you use it. Ta-da! Done! 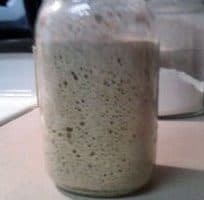 When you want more, take a 1/4 cup of that batch, put it in a jar, add milk to the shoulder, and do the James Bond thing. Ya know – shaken, not stirred. Or stir it. Either way. And let it sit for 12-18 hours. You should be able to do that for a long time if you make a new batch once a week. That keeps the cultures really strong. And the cultures actually help to preserve the milk. Buttermilk lasts practically forever. 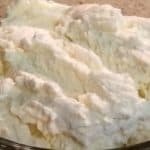 So, if you don’t use enough to make a new batch every week, I would suggest you use the easy way. 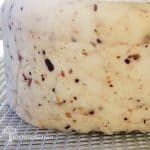 This way uses a purchased culture from a cheesemaking place. I get my cultures here . You use the culture to make what’s called a “mother culture”. And in an aside, I had teenagers when I first started doing my own cheese and dairy, and the “yo’ mama” jokes and the cutting the cheese jokes were done. to. death. But I digress. 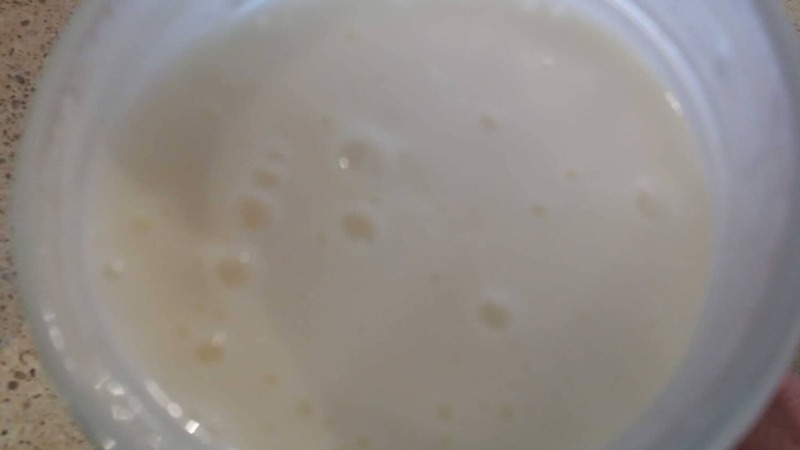 To make a mother culture with pasteurized milk, you just slowly heat the milk to 70-77° F, put it in a jar, add the culture, mix well, put a lid or other cover on it, and let it sit on the counter for 12-24 hours in a warm (70-77° F) place. If it has thickened after 12 hours, go ahead and put it in the fridge to chill. If the culture is still not thick after 12 hours, let it sit longer. Up to 24 hours. 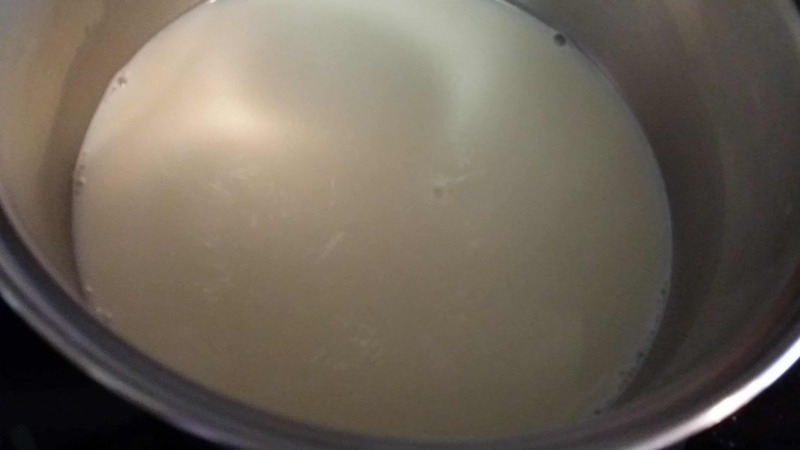 Even if it’s not thick at 24 hours, it’s still cultured and will make buttermilk. Let it chill for at least 6 hours before you use it. After 6 hours, put 3 Tbsp of the mother culture in a quart jar. Add milk to the shoulder (that’s 3ish cups of milk). Mix, cover, and let sit for 12-18 hours in a warm spot. Chill for 6 hours before using. I freeze what’s left in 1 Tbsp cubes. 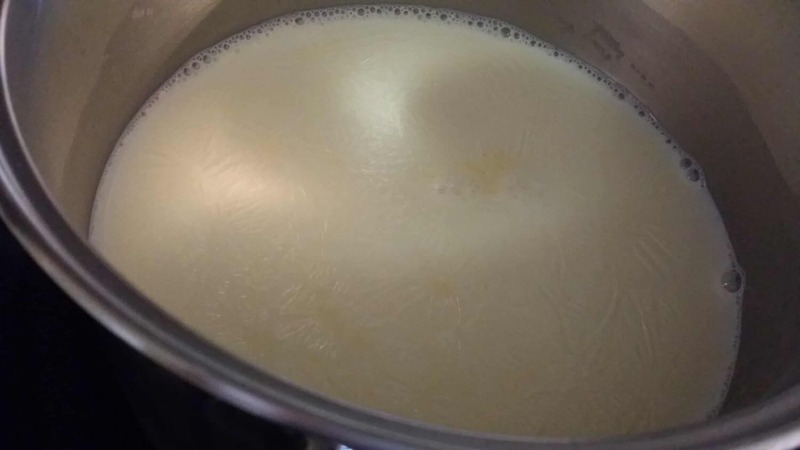 You need 1 Tbsp of the mother culture per cup of milk to make buttermilk. So you could always just make 1 cup at a time if you wanted to. When I get down to only 3 cubes left, I use them to make another batch of the mother culture to freeze. It works like that for a really long time. 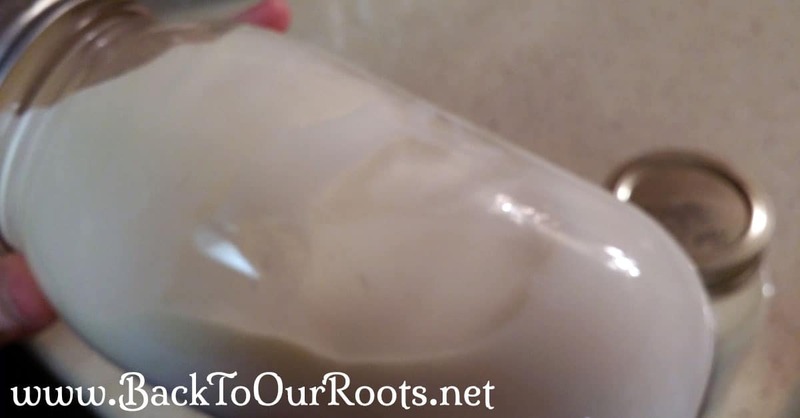 If you are using raw milk fresh from the farm, you will need to pasteurize it to make the mother culture. That helps to keep the buttermilk culture pure and helps it last longer. Heat the milk slowly to 160° F. Allow to cool to 70-77° F. Put into a jar, add the culture, mix and let sit for 12-24 hours. Continue with the previous instructions. See, I told you it was easy! What is your favorite way to use buttermilk? 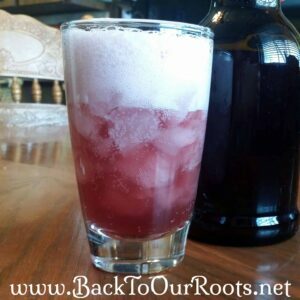 Nice post, Thanks for sharing with us on the Homesteader hop! I always thought it was the leftover liquid from making butter too! This was really interesting and I’m hopeful to try it. Thanks for sharing! I get active culture buttermilk from the grocery store. It’s usually right next to the milk. Or you can buy buttermilk cultures online. 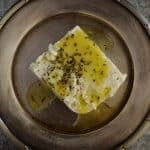 I prefer the Cultures for Health products for my cheeses and ferments. You can also get their products from Amazon.